Do you love to dress up your little one? Then, it is time to upgrade their closets with the most stunning and smartest array of clothing pieces crafted by the leading wholesale kids clothing brands, available readily at the retail stores. The little ones can now get exposed to a wider range of fashion statements, that vary from denims to florals to lace and much more. The leading kids clothing destinations are making sure to craft the most stupendously designed clothes that can effortlessly deliver both comfort and style proportionately and add some freshness to the cute personas. So, what do you prefer for your child? Size or comfort? Drop all your worries as in the online shopping destination, the wholesale kids clothing suppliers make sure to add kids clothing range that include a large inventory, consisting of a variety of sizes, fits, fabrics and styles. These clothes emote something innocent, as well as novel and fashion forward, keeping in mind the recent style trends that surface the global fashion scenario. This fall and winter, time to take a break from the usual sweaters and the other knitwear options, and bank on to the military jackets in navy blues, or some other shades too. The military jackets come in different color, but the style remains the same, with the classic and vintage design. These are made of warm fabrics, and can be easily layered with dresses, shirts, tops, denims and much more. They are basically unisex and look great. 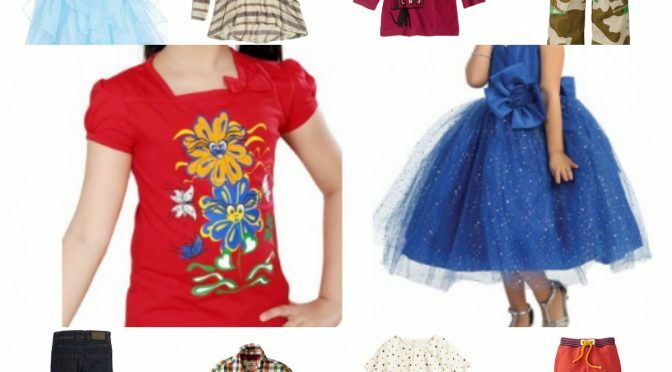 If you are looking for something different for your little girl for the festive season, you can go ahead with the lace worked clothes, be it the gowns, little dresses, or the tops and skirts. The lace clothes come in an array of styles and designs, that connote something glamorous and also sweet, without letting the wearers feel inconvenient at all. You might have been quite used to buying the denim clothes for your little ones, from dresses, to jackets, jumpsuits, shirts or pants, bit today, a new twist has been incorporated. The embroidered denim clothes look absolutely splendid, and come in different ideas, be it something feminine, to fresh or smart. You can get these denim clothes with rich thread work in different color scheme, worthy to be worn anywhere. No matter how many new trends come, the floral designer clothes for the kids will definitely keep reigning supreme, be it through the dresses or the shirts for the boys. The floral designs come in bright and vivacious color schemes, in contrasting effects that exude something happy and cheerful. If there is one of the designs that reflect vintage and retro vibes, you have to count on the gingham plaid clothes for the little ones that denote something very simple yet stylish. The plaid gingham frocks to shirts or even the pants look very classic, and add to child’s stylish edge effortlessly. Are you up for some festival or party to dress up your kid? You can count on the fringed clothing pieces, be it the dresses, the leather jackets or the fringe playful skirts. These are quite funky and preppy and carry a childlike affair that suits them completely. Thus, keeping in mind the trends and also the factor of comfort, go for the best and most stylish kids clothing pieces crafted by the leading clothing manufacturer.